First Impression: Bob wants you to know he’s going to eat you last! Second Impression: Huh, I guess Soylent Green is people. Can we talk for a minute about what is going on with Bob’s forehead? Apparently NBC has been putting Human Growth Hormone into his oatmeal smoothie. The DVD begins with Bob, Kim, and Jillian standing with hands on hips, staring down the camera. Look how confident and authoritative they are! Jillian has mastered the additional trick of standing with her weight cocked over on one hip and her shoulders askew, which is supposed to signify she’s the edgy one with attitude. Really, it just looks like she has terrible scoliosis. Okay, sidebar: everyone who has ever told me they have scoliosis always adds, “curvature of the spine,” to explain what scoliosis is, even after they’ve mentioned it several times. I get it, we get it, America gets it. We all read the Judy Blume book about the girl whose mom wants her to go into modeling, but she can’t stand up straight so she gets fitted for a back brace and decides to be an orthopedist instead. The book was banned in several states for its frank discussion of eczema. Anywhoo… Cardio Max. Just select all the routines and power through! 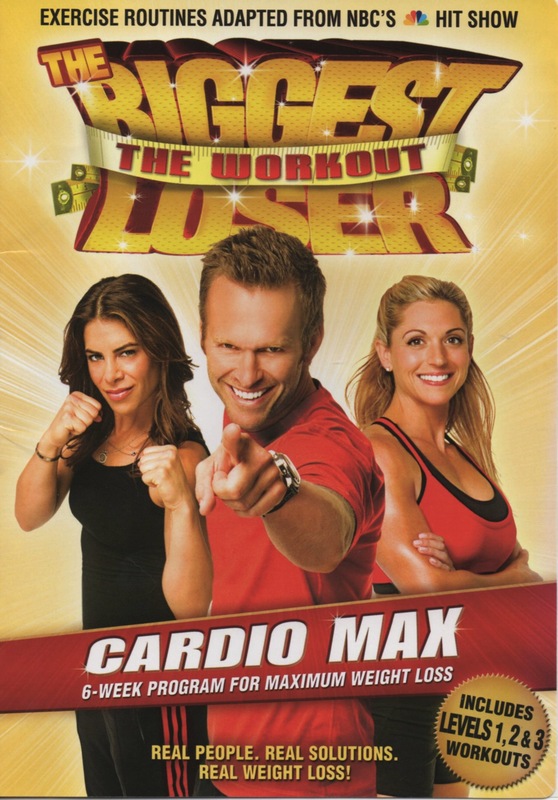 Like Weight Loss Yoga, this workout features former contestants on “The Biggest Loser” who help demonstrate all the jumping, punching, kicking, calorie burning moves. One of them, Pam, serves as a surrogate for the home user when she exclaims, “I wanna kill you right now, Bob!” Bob just laughs it off and corrects her, “No! You love Bob!” He might be right. Halfway through the video I realized I was having a really good time working out! Well, what do you know. This entry was posted in Reviews and tagged 60 minutes, abs, calisthenics, cardio, Celebrity Host, corporate, fun, hand weights, plyometrics, talky, trendy, varied routines. Bookmark the permalink.